"I bought this rattle for my 7 month old granddaughter and she loves chewing on it. So far it’s holding up well to her drooling and chewing....even though she doesn’t have any teeth yet she’s gumming the ears fiercely!" "My baby granddaughter loves it! It is so soft, and easy for her to hold." "It’s fine just surprised at how small it is!" "I purchased the hot sauce rattle for my niece. The rattle is high quality and very cute. Shipped quickly and arrived with time to spare before Christmas. " "I bought this as a gift. Everyone thought it was precious. It is so sweet and delicate for baby." "So cute! Perfect for my baby nephew"
"Hi, thank you! The rattles and blankets were awesome and so was the customer service. I wish I could remember the person's name who helped me out. We needed the gifts in time for Thanksgiving and he reassured me that they should arrive in time and also described a contingency plan just in case. Please thank him if you can find out who he was." 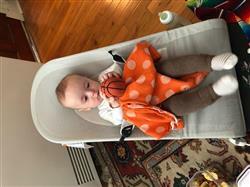 "The basketball rattle is darling! I purchased it for my 4.5 mo old baby boy for a stocking stuffer as his Dad LOVES basketball. The rattle is well made and is even holding up with my baby's constant drool and chewing :) I highly recommend this. My baby loves the texture, the sound and the ease of holding onto it and putting it in his mouth!" Very cute & well made! "Just as pictured and really good quality!" "When I first saw this rattle set, I knew it would be the perfect Christmas present for my little NYC ex-pat niece. She loved them! They’re so soft, she loves to chew on them. They’re the perfect size for her, and even when she outgrows the rattles, they’ll make for adorable decoration. I also wanted to make a note about the amazing customer service. After I ordered this set, they emailed to let me know that it was in back order and might take longer than usual to ship, and asked if I would like something else instead. That was very thoughtful. And i after I received the rattle set, they emailed again just to ensure that the shipment came through. I really appreciate the care and concern they put into every product." "I've gifted this so many times - yellow and green for my borough friends. Such a sweet alternative to the same old baby items!" "I purchased three rattles and was beyond impressed! The quality is beyond what I hoped for, and the design is so unique and one of a kind! Hope to buy again from this company soon! " "Beautifully made and professionally delivered. Mom and baby like it very much. Thank you. " "Item was very cute, just as described. Thank you!" "I have been eyeing this for a while, and we used it as a stocking stuffer to announce the name of our baby to our family (name was embropidered on the stocking, the octopus was delivered by Santa). This will be our son's first lovey, and our 3 year old daughter approves." "I love these toys for infants. I’ve given the baseball, football and basketball to my 3 month old grandson. His dad loves them too. " "I have purchased Estella products for years, but this is the first time I have purchased them directly from the company. The pillow came as promised, and was the perfect addition to our New York themed nursery." "Was very adorable! It’s a gift so have not seen it on!" "Truly love the taxi baby blanket and rattle! Super soft organic cotton and the design is impeccable and unique! I would buy again from this store! Fast shipping, good service. " "This is the perfect hand-made gift that's guaranteed to delight parents and babies. Beautiful design and function. " "I purchased this little bear for my soon to be born son. It is so teeny and cute! I cannot wait to have him cherish it." "This little rattle is so cute! We bought this, along with a few other NYC-themed items, for our friends in Portugal upon the arrival of their new baby! It was so nice to find such quality NYC baby rattles, blankies, and onesies - I will recommend over and over! " "While this product hasn't quite been 'used' yet (baby's due in Feb), this is one of the cutest things currently gracing the nursery. It's soft, adorable, and has a great non-jarring rattling noise. " "Love these products! Perfect for new moms or ones who just really care about what materials their baby is introduced to. High quality and attention to detail. These items/gifts really make a statement and show that you took time to shop for the little one you care about." "I love this product! Definitely worth it. " "Awesome quality and adorable. Highly satisfied!! " "I have always loved the Estella dolls for my 2 girls, and this recent purchase was for a friend who recently Moved away from nyc who had a baby. He loved it so much! Also thank you for delivering it so quickly! "